Is That A Meltdown or a Tantrum? Recognising and managing meltdowns and tantrums is vital to support people with ASD. Every child with ASD will experience very individual symptoms that are unique to them. It is very important you are familiar with each child’s triggers and responses. Recognising and managing meltdowns and tantrums is vital to support people with ASD. Every child with ASD will experience very individual symptoms that are unique to them. 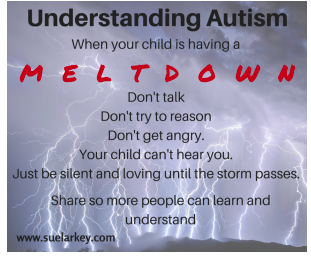 Not all individuals with ASD will experience a “meltdown” and instead may “shut down.” It is very important you are familiar with each child’s triggers and responses. The book From Anxiety to Meltdown by Deborah Lipsky is full of insight, information, strategies and more. It will give you the keys to differentiating between a meltdown and tantrum, and more importantly how to deal with them effectively. Below are some great excerpts from the book. 1.Sudden abrupt changes (novel situations). 5.Being given too many choices at once. 6.Vague or unclear instructions and/or commands. 7.Being asked open ended questions that are too broad. 8.Being forced to be in a prolonged stressful environment. 9.Being in a stressful setting or situations without anycalming tools. 10. Being given an unrealistic task that exceeds capabilities orlimitations. 11. Going to or being the centre of a surprise party. 12. Crowded places and/or events and activities with a highnoise level. 13. Being rushed or hurried to do or finish something. d)using literal timeframes in a way open tointerpretation, such as wait a minute. 15. Being given a time limit. 17. Being forced to socialise during lunch periods at school. Tantrums are a conscious deliberate choice to behave acertain way to manipulate others. In a tantrum the physical movements are controlled andeasily altered to achieve a desired outcome – i.e.aggression towards a specific individual. A tantrum can stop instantly at any time. In a tantrum they may try to bargain. In a tantrum the individual has excellent recall of theepisode with little or no physical exhaustion. Please note a tantrum can develop into a meltdown. This book is clear, insightful and practical. A MUST have for every school and family. One of my favourite books to understand Meltdowns! Anxiety is the root cause of many of the difficulties experienced by people on the autism spectrum, and is often caused by things such as a change in routine or sensory overload. Deborah Lipsky takes a practical look at what happens when things spiral out of control, exploring what leads to meltdowns and tantrums, and what can be done to help.